Serving Palm Beach and Broward Counties, we carry out safe, secure document destruction. The Red Shredder is an on-site paper shredding and hard drive destruction company headquartered in Delray Beach, Florida, providing on-site shredding services to Palm Beach and Broward Counties. We have a state-of-the-art hard drive destruction system to get the job done right. Our secured and locked containers ensure all documents will remain unseen and untouched until our truck comes. Although we are The Red Shredder, we think Green. We recycle 100% of shredded materials. From scheduled shredding services to a one-time purge of everything, we have paper shredding service options to suit your needs. It's not only good practice. Paper shredding is the law. Find out more about why your business needs to shred. The Red Shredder is a Delray Beach paper shredding company providing Floridians with efficient and secure document destruction. A few questions, and we can analyze your needs and prepare a quote specific to your company’s paper shredding and destruction needs. 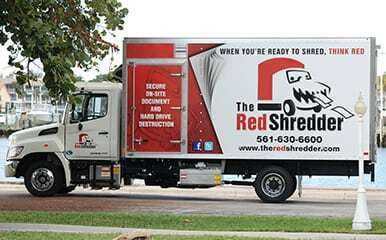 The Red Shredder, located in Delray Beach, proudly performs secure mobile on-site paper shredding in Palm Beach County and Broward County in Florida.